Things didn't go quite to plan today. We were up in reasonable time and straight in to the shower block. It was so nice to stand under a lovely hot shower and not have to fret over how much water we were using. I spent most of the day wearing only my swimming shorts so that everything else could be washed along with the bedding. That way we'd be bang up to date. We gathered up much of the washing, intending initially to put it in a washing machine, something we don't normally do. That was until we noted that for €3.50 the machine would not only wash and spin your clothes but also add the necessary washing powder and softener. We didn't like the sound of that. It could be any product, and what if we found it irritated our skin once it was worn or slept on. We've had this problem before and that's why we carry our own Bio liquid around with us, a product we trust and have never had any problems with. So out of the machine it came, and off we went to the hand washing sinks. I washed and The Chef did the rinses. We had made good progress and I left The Chef to carry on rinsing whilst I put a washing line up between two large trees. Then back I went with the remaining washing. The Chef was keen to get the first batch out to dry so she disappeared while I carried on with the remaining washing. She was gone ages, and had taken a plastic folding bucket I needed. I was about to down tools to find her when she appeared. She explained that she'd been delayed chatting to our next door neighbours, and then had to sort out the disaster. What disaster? I enquired. It seems she made the mistake of asking the neighbours whereabouts the nearest drinking water tap was located. They could do better than that they said, and offered her a five litre plastic bottle of drinking water from the boot of their car. The husband even offered to carry it to the vehicle. As he put it just inside the doorway the plastic bottle, which must have become brittle, split, spilling water on the floor and carpet. Today's chores now needed to include getting the carpets out which were going to be done tomorrow when we are clear of this sandy ground, but now had to be done today. The carpet had to be removed to be dried as well as the plastic protective covering. Special attention had to be paid not to tread anything in to the vehicle and scratch the flooring, as well as avoiding bringing in any flying ants which had a nest at the edge of our pitch, and were marching in their thousands backwards and forwards across it. As we had too much washing to hang on the line, the rest was laid out flat on our two large folding tables and left in the heat of the day to dry off. When all that was done and I just had the swimming shorts to wash, I grabbed my shower gell, went to the shower block then in to a cubicle where I rubbed gel over myself and the shorts and then proceeded to shower myself and wash the shorts at the same time. The temperature today has been an incredible 30˚C, too hot to do anything much at all really, except dry clothing, especially when you're also wearing it. By the time we had finally got straight there wasn't really any time left to do anything else, and so it has become a very nothing day. The leisure battery continues to give us problems. I think I have a problem with the onboard auxiliary battery charger, as there appears to be no power going to it, yet the fuses for the habitation area look alright. 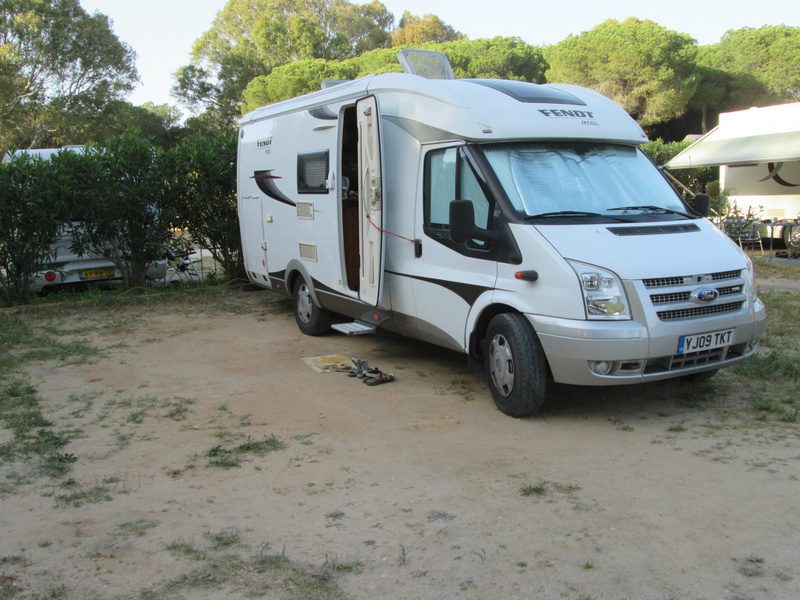 I think we will have to keep an eye out for a Ford dealer or motorhome dealership who can perhaps sort it out for us. We are now about ready to make our way to Seville. There are about three options, two of them are at grotty parking areas in town, and the third at a Marina about five or six miles out with a bus service in to town. I favour keeping out of town and having a better environment, whilst The Chef seems to fancy going in to the city for the sheer convenience of it. I think I need to show her Google Maps Street View before we set off so that she is fully aware of what lies ahead if we go for her preferred option. The Chef informed me this afternoon that Theresa May is calling a snap General Election. I think that is very risky indeed. Opportunists like the LibDems are likely to promise a second referendum if people vote for them, thus appealing to about 48% of the electorate. It could get really messy. Then there's Jimmy Krankie up there in Scotland. The election will be an interesting test of her popularity I suppose. Isn't it reassuring to know we have Comrade Corbyn waiting in the wings to save us all should things go wrong? See you in Seville where we'll be for at least two days as there seems to be lots of sightseeing to do, including some flamenco dancing all being well.